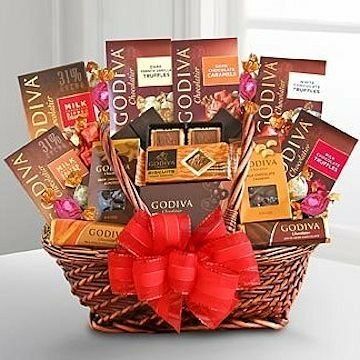 Send your loving wishes in a grand way with a romantic basket filled with Godiva® chocolate! Indulge their sweet tooth with an array of premium favorites. This basket includes the following: Godiva® milk chocolate and a salted caramel bar, dark chocolate covered almonds, a Godiva® solid milk chocolate and dark chocolate bar, chocolate-covered pretzels, Godiva® signature biscuits, milk chocolate-covered cashews, milk chocolate truffles, a milk chocolate and strawberry bar, a bag of dark French vanilla truffles, a bag of dark chocolate caramels and a bag of white chocolate truffles. All Godiva® and all exquisite!